At about 9:59 p.m. ET, a Tennessee witness driving west along Highway 70 near Pleasant Hill reported watching "a large, triangular-shaped" object hovering over power lines in MUFON Case 47032. "I noticed a large triangular type shape with a big lit circle in the middle of it," the witness stated. "The light was several feet across and was illuminated with white light. The object looked dark gray as far as I could tell and the shape was triangular but with curves. I figured it must be a UFO to be just hovering like that over the power lines." The witness drove directly under the object. "I could only see the underneath because I was passing under it. I couldn't believe it was hovering over me a bit to the left and over the power lines. I observed the power lines were just a few inches underneath the object. It did appear to be coming closer to me. I also slowed down the vehicle a little so I could keep watching and ducked my head some to continue to see." 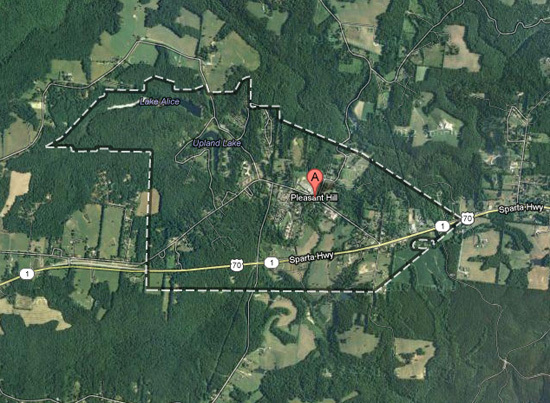 Image: Google Map of the Pleasant Hill, Tenn., area where the first UFO was seen hovering over power lines. "I noticed four beams of light that went from one side to the other of the object and pulsed about four times on and off. The lights were about 6 to 8 feet across -- larger than the circular light in the middle." The witness tried to keep the object in view. "I tried to see if I could see the object in my rear view mirror but it appeared to be gone. I did not observe any sound from the object even though it was only about 20 feet above me. I figured the time of the sighting must have been 9:59 p.m. on April 27, 2013. The sighting must have lasted about 10 seconds." There were no cars traveling in the same direction of the witness at the time. "After continuing about one-half mile I did see two different cars coming from the other direction and I flashed my lights at them just to alert them, in case the object was still in the area or if it possibly landed." No photos or videos were included with the report. Pleasant Hill is a town in Cumberland County, Tenn., population 563. Read the complete story. Then two hours later, at 10 p.m. MT, a Colorado witness in Arapahoe County just east of Denver reported watching "a giant white, triangular-shaped object" crossing the sky from horizon to horizon in about two seconds in MUFON Case 46036. "I had just focused my eyes on an airplane when suddenly a giant white, triangular-shaped object appeared," the witness stated. "It was directly above me. It was enormous and it was moving amazingly fast. It traversed the entire sky -- horizon to horizon in about two seconds. It was hard to reference the size, exactly, but I got the sense that it was a very large object very far away." Image: Google Map of the Arapahoe County, Colo., area where the witness saw the large triangle-shaped object moving overhead. "This thing was pushing the limits of physics. The corners of the triangle were rounded and the lights were big circles -- the light was yellowish-white, and it was kind of dimly lit. I really got the sense that it was very far away, way up in the sky." No images or videos were included with the report. Arapahoe County is the third most populous of Colorado's 64 counties, population 595,546. Read the complete story. The triangle is one of the top five most reported UFO shapes in the U.S. Although the two cases may not be related, both witnesses described the object as triangular in shape, very large, with rounded edges, and multiple white lights. Both cases remain under investigation. The above quotes were edited for clarity. Please keep in mind that most UFO reports can be explained as something natural or man-made. Image: Google Map showing the 1,200-mile journey between Pleasant Hill, TN, (A) and Arapahoe County, CO (B). Triangle UFO Hovers, Emits "Blinding Light"